The crew of the Rocinante confer in a scene from the Season 2 trailer of "The Expanse," airing on Syfy in early 2017. The season finale of Syfy's space adventure "The Expanse" left viewers with answers about the fate of Julie Mao, whose disappearance set into motion the events of Season 1, but with even more questions as the show delves deeper into the solar system's conspiracies and political tensions. Questions like: What the heck is that deadly protomolecule, anyway? Season 1 started with a slow burn as viewers began to understand the show's universe and Detective Miller slowly began to unravel the mystery of Mao's disappearance. In Season 2, expect more action and a faster-moving plot. "In the first season, the Rocinante crew are trying to figure out what's going on and they're just being thrown around," Steven Strait, who plays James Holden, told Space.com. The second season puts control into their hands, he said. Instead of the plot dictating the character's actions, Miller, Holden and the crew will make decisions that push the plot forward. More action doesn't mean you'll lose sight of the characters, though. Executive producer Mark Fergus said it's important to the cast and crew that the show is, at its core, about people. "It's not really about technology or space or aliens," he said. "This is a story about people and what they go through when new technology changes the possibilities of their lives." As the conspiracy and drama get bigger and bigger, relationships between the characters will also get deeper. When the show began, Miller was a surly detective who had lost his faith in humanity and Holden was young, sometimes naive and idealistic. Over the course of the first season, and even more so in the second, their characteristics begin to shift. As Holden gets more embroiled in the solar-system-wide conspiracy he starts to lose some of his idealism, while at the same time Miller, working with Holden and the rest of the Rocinante team, gains back some of his faith. Both characters were shaken when they witnessed a horrific event on Eros at the end of Season 1. "That changes people," Strait said. "It will shape them as people, as lovers, as shipmates." To prepare for that kind of character change, Strait spoke to psychologists about the experiences of peacekeepers in Rwanda, who witnessed a genocide but couldn't do anything about it. "When you're portraying these things you want to keep it as respectful as possible and to really portray that kind of realism," he said. You can expect to see political tension among the factions play out on a small scale between Nagata and Holden. "Holden and I get romantic this season," Tipper said. "But I don't think it's going to play out in the way anyone expects." Nagata grew up as a Belter and Holden as an Earther, so their political ties get in the way of their relationship. "They want to be together but things are driving them apart," she said. This new protomolecule is deadly — we saw that in Season 1 — and its threat could bring the factions together. Strait calls it a "game-changer," and says the factions will have to learn to work together if they want to survive. "Are you an Earther, or a Belter, or a Martian doesn't matter anymore," he said. "If we stay divided, there's no people left." 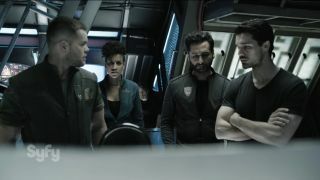 Although Fergus and the other producers on the show want "The Expanse" to focus on the characters, they can't deny their excitement about the special effects. What viewers probably don't realize, though, is that much of the scenery is actually real rather than computer-generated. "They're real places and real chairs — you can walk through the ship," Fergus said. Season 2 takes the Rocinante crew to even more exciting places, which for set designers and carpenters means building new sets every other week. As an actor, Strait says the physical sets help him get into character. "You don't need to focus on the empty space of a green screen, you can just focus on the human element of what's going on, instead," he said. Still, the green screen is obviously important for any show set in space and helps viewers get lost in the world of "The Expanse." "At its core it really is a political drama, but it doesn't hurt to have awesome special effects and space battles and epic ships," Strait said. "The stakes are really high and we've been lucky enough to show these massive things happening."